In the summer of 1989, twelve-year-old Cameron Post kissed her best friend, Irene. The next day, her parents died in a car accident. For Cameron, the two events would be forever linked, not that she could explain that to her born-again Aunt Ruth, who moves into Cameron's house in Miles City, Montana to become her guardian. Cam knows enough not to talk about her attraction to other girls, let alone how she spends her time with them in the secrecy of haylofts and under the dock at the lake. But during the summer after her first year of high school, just when it seems that the girl she has fallen for might become more than a friend, her aunt finds out. Cam is packed off to God's Promise, a "Christian School & Center for Healing" for an indeterminate stay. While the staff there tries to help her "break free from the bonds of sexual sin and confusion", Cam realizes she risks losing herself before even finding out who that really is. This is a beautifully written book. Danforth has the sort of polished style I expect from graduates of MFA Fiction programs (and she does hold an MFA in Fiction from the University of Montana, along with a PhD in Creative Writing from the University of Nebraska - Lincoln). This is both a blessing and a curse, because it produces a feeling of distance between the reader and the narrator, despite the first-person voice, and between the narrator and the events. Maybe because Cam is clearly telling her story from some point in the future, it lacks immediacy. Cameron comes to terms with the wrong done to her by recognizing that these are deeply held convictions of people who truly believe they are working in her best interest, a realization that would seem to come with the perspective of time passed, and she refuses to outright condemn the sort of program that God's Promise represents. Instead, she allows the reader to live through her experience, letting him form an opinion based on life on the inside of the program, the side its supporters rarely (if ever) really see. 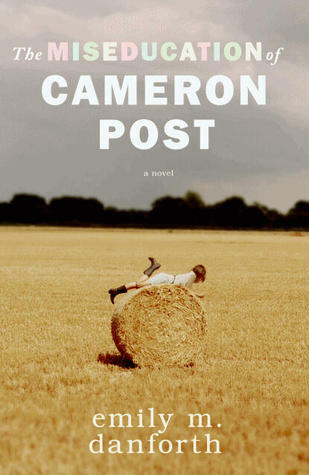 The Miseducation of Cameron Post is an expertly crafted work, a fine example of Literary Fiction that happens to feature a lesbian teenager as its protagonist. And that is a wonderful thing, a fantastic thing. I would love to see more literary fiction with queer characters. After all, must a protagonist be a straight white male for the work to be one that "explores universal themes of truths and/or humanity in general" or, perhaps more significantly, "broadens the reader's impressions of the human experience"? When it comes to this book, my negative feelings aren't really about the book at all. They are about the marketing of this book as a teen title, when, really, it feels like an adult novel featuring a teen protagonist. The book itself is lovely. I worry, though, that it will have trouble finding readers who will enjoy the style enough to finish the story and reach the absolutely perfect ending. I'm a teenager, and I didn't feel like it was too adult for me. It seemed about my age level and nothing in the book was something I wouldn't imagine one of my classmates doing. Ashley...(BookNerd) wrote: "I'm a teenager, and I didn't feel like it was too adult for me. It seemed about my age level and nothing in the book was something I wouldn't imagine one of my classmates doing." Thanks for commenting - it's great to hear other people's perspectives. It's a fantastic and amazing book, and I'm thrilled you came across it and enjoyed it!